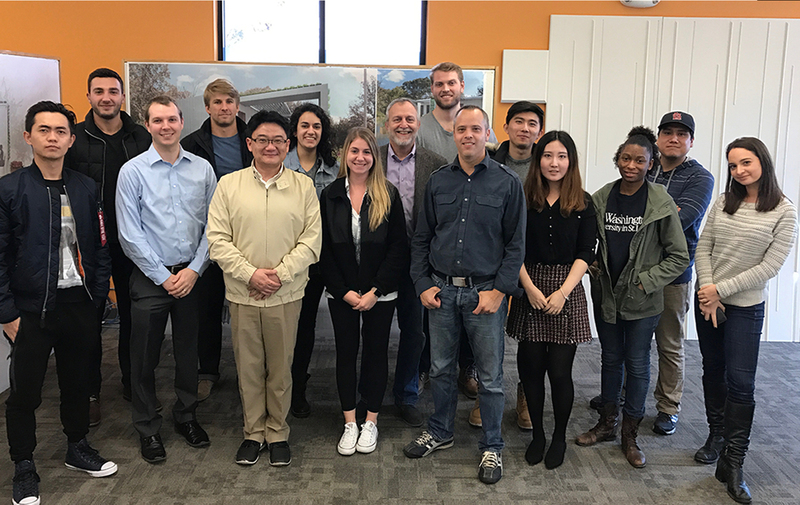 With CRETE house, the U.S. Department of Energy Solar Decathlon 2017 team from Washington University in St. Louis, Missouri, wants to send a message that concrete can be a viable, sustainable, and beautiful alternative to light wood-frame construction. The students designed their house with precast insulated panels that are manufactured in a factory and assembled on-site. Large gutters extend out from the main concrete structure and offer support for shading materials while creating outdoor living space. The gutters also collect and direct rainwater and serve as vertical planters. This hydroponic system is part of a productive landscape that should enable the occupants to grow food all year round. The Wash U – St. Louis team believes that the durable, stormproof, and fire-resistant CRETE house will still be standing a century from now. With CRETE house, the Wash U – St. Louis team strives to demonstrate the efficiency, resilience, and market appeal of its precast concrete home. The design of CRETE house focuses on all aspects of self-sufficiency, including energy, water, and food production, and it demonstrates innovative ways to utilize the home’s exterior to grow food sustainably. Resilience in the face of tornadoes and strong winds is an important goal. Because the entire envelope is precast concrete, it demonstrates resilience against fire, moisture, mold, insects, and extreme weather conditions. The concrete structure serves several practical functions but also drives the home’s aesthetic, helping make the argument for cast concrete homes as a compelling alternative to traditional light wood-frame construction. The Wash U – St. Louis team’s ultimate goal is to demonstrate innovative design and solutions that positively impact the building industry, develop the next generation of architects and engineers, and improve humanity’s connection with our planet. The team developed a precast concrete sandwich panel for the exterior walls, consisting of four inches of standard concrete, five inches of insulation, and one inch of “Ultra-High-Performance-Concrete,” or UHPC. CRETE house is designed for resilience, protecting against fire, moisture and mold, insects, seismic events, and extreme weather conditions. The hydroponic growing system consists of vegetated channels, modular vertical and horizontal ground planters watered with drip emitters. A water-to-water heat pump provides domestic hot water and chilled and hot water for the radiant heating and cooling system in the floor and ceiling. The expected life cycle of CRETE house is 90 years or more. As a prototype, the team from Wash U – St. Louis believes CRETE house has the potential to be an affordable option for a variety of homeowners. It is designed to be sustainable, have low operating costs, and to be easily constructed on any plot. Its prefabrication and modular construction also give it additional flexibility. CRETE house addresses self-sufficiency in terms of energy, water, and food production, and it provides an attractive outdoor space with varying capacities for growing food sustainably. If CRETE house were integrated into neighborhoods within St. Louis, a sustainable edible garden could serve as a hub for the community, promoting collaboration and self-sufficiency, especially in food deserts. Like many cities in the Midwest United States, St. Louis is in a tornado risk zone, and CRETE house is designed to withstand the force of strong storms while keeping its occupants safe. After the competition, CRETE house will be the first building in a planned eco-village of zero-energy-ready buildings at the Washington University’s Tyson Research Center in Eureka, Missouri. The house is designed to house two research scientists stationed at the research center. Neither the United States, nor the Department of Energy, nor Energetics Incorporated, nor any of their contractors, subcontractors, or their employees make any warranty, express or implied, or assume any legal liability or responsibility for the accuracy, completeness, or usefulness for any purpose of any technical resources or data attached or otherwise presented here as reference material.